Jurnal Penyakit Bersumber Binatang (The Journal of Zoonosis) is media of information media Research and Development or Animal Sourced Disease focusing in research or study about malaria, filariasis, dengue fever, anthrax and rabies. The journal is published by the National Institute of Research and Development (Loka Litbang Penelitian Penyakit Bersumber Binatang, Waikabubak) published regularly 2 times a year. Jurnal Penyakit Bersumber Binatang (The Journal of Zoonosis) has been indexed in: Public Knowledge Project; Open Journal System Badan Litbangkes; Google Scholar; and BASE (Bielefeld Academic Search Engine); Indonesian Publication Index. Jurnal Penyakit Bersumber Binatang (The Journal of Zoonosis) is being reviewed by Universal of Impact Factor. Public Knowledge Project; Open Journal System Badan Litbangkes; Google Scholar; and BASE (Bielefeld Academic Search Engine); Indonesian Publication Index. 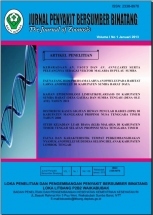 Jurnal Penyakit Bersumber Binatang (The Journal of Zoonosis) is being reviewed by Universal of Impact Factor.